It would be great to be able to start this post talking about how the Model S, much to the amazement of many owners, has a 12V lead acid battery. Sadly, I can't do that - because this battery is a failure-prone sore point among many owners, and far too many owners with a >2 year old car are entirely aware of it, as the battery has already failed and been replaced at least once. This little gizmo is the cause of an awful lot of unhappiness with the Model S.
Anyway. I was wandering around the internet and came across something interesting. 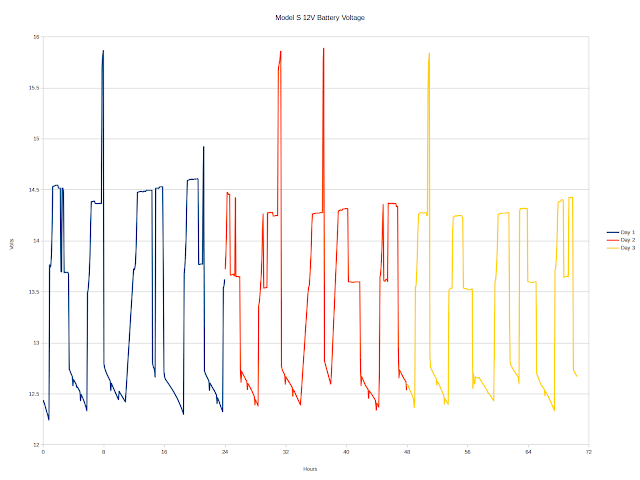 I've got, on my flash chips, this tiny little file that, on analysis, turns out to be a few days worth of data log from a Model S 12V battery system in late 2016. Voltage, amperage into or out of the battery, and some surrounding data about charge state and the like. Rumor has it that the power settings are "Energy Saving : Off" & "Always Connected : On." So, in I dive! Chart a course to graphs! 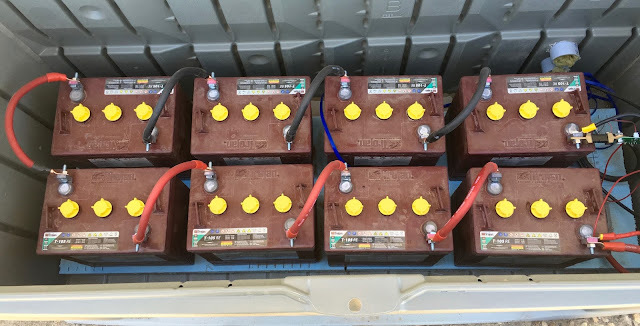 First, it's important to explain why the Model S has a 12V lead acid battery in the first place - and why the battery is lead acid as opposed to one of the assorted lithium chemistries (which is a common question every now and again as people find out that, surprisingly, their lithium powered car has a lead acid battery). Lead acid is a very, very old battery chemistry - it was invented in 1859, so it's over 150 years old at this point. There have been many refinements over the years, but at the core, you've got lead plates, sulfuric acid, and chemistry. The energy density is poor, but the power density can be quite good (this is why it's used in most cars - it's great at turning starter motors for a few seconds). Lead acid also has a very important characteristic: If properly charged, it doesn't freeze (above -90F or so) - and it can charge and discharge safely over an incredibly wide temperature range without being damaged. That's not true of lithium chemistries. If you try to charge a lithium batter when cold, you end up with lithium plating, which permanently reduces capacity. Lead acid will put out less power and energy when cold (this is why "cold cranking amps" matter), but it's not damaged by use in the cold. Discharging doesn't damage lithium in the cold (it lacks power, but isn't otherwise affected) - but charging when cold is really bad. The Model S will use the charger power to heat the battery pack before charging, if needed. Fine for a traction battery, not so good for a regularly cycled utility battery. Cars have to operate reliably over a huge range of temperatures, and lead acid is really good for providing basic power to a car. Also, every single car part out there in parts bins is designed to work on a 12V lead acid battery operating range. The Model S uses the 12V system to run pretty much everything. The computers run off the 12V system, the interior electronics (locks, windows, seats, etc) run off 12V, and the main contactor for the big battery underneath requires a functioning 12V system. If the 12V battery is dead, so is the car. There are jump start terminals (which, by the way, you shouldn't use to jump another car), but the Model S is entirely reliant on this 12V lead acid battery to function. If you replaced this 12V battery with a lithium battery, you'd have to add heaters and the like to it - you simply cannot safely charge a lithium battery below about the freezing point of water. Of course, if you never let your car below about 40F, a LiFePO4 drop in replacement would probably work fine, assuming the computers didn't notice and complain. The Model S 12V battery lives somewhere ranging from "convenient to replace" to "really damned annoying to replace," depending on the particular options. It's orange, here, in one photo that did the rounds a while ago. 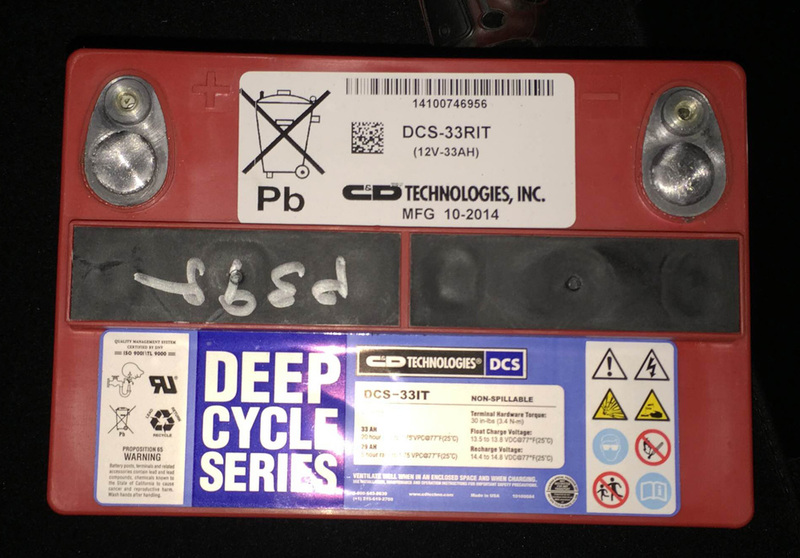 The battery is a C&D Technologies DCS-33RIT, at least in many of the cars. I don't know if they've changed to a new battery or not on the brand new vehicles. What's in a DCS-33RIT? There are a few data sheets: a DCS-33 specific data sheet, and a data sheet for the whole DCS series. There's also an installation manual for rack mounted batteries, but it includes some charging instructions. General design is AGM - Absorbed Glass Mat. Cycle life at 50% depth of discharge is 1800 cycles, at 20% depth of discharge is 5700 cycles. This is a standard valve regulated battery (it vents overpressure). So... pretty much a bog standard AGM battery. Nothing exciting, though the capacity (33Ah/12V - it's only ~400Wh fully drained) seems quite low for a car that pulls so much standby current. How does the Model S charge the 12V battery? From the main battery, of course! There's a programmable DC-DC converter in the system that steps the main pack voltage down to the voltage needed to charge the 12V battery (and run the 12V system). That serves the same function as the alternator in an internal combustion car, though it's under computer control (as observed below). This means that the 12V system has to be online to charge the 12V system - if the 12V system is dead, the computers won't engage the contactor to turn the main battery bank on, and it can't recharge. Onto the analysis from the data I have. The images zoom if you click on them - I opted for maximum data in the image and the don't scale down quite as nicely as I'd hoped. 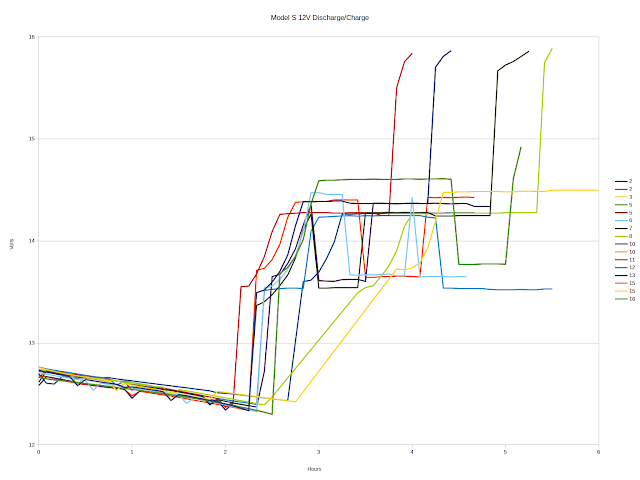 So click on them if you want to see the full graph. Here's the full log over roughly three days. It's broken by color into day to make it easier to see the cycle count per day. Two things stand out here to me. First, the number of cycles per day is absurd. The car is putting 5 cycles a day on the 12V battery. That's rather high - so that long cycle life rating doesn't mean what it normally does. At 5 cycles a day, a year is 1825 cycles. At 50% depth of discharge... well, that's your battery life and then some. The second thing that stands out is those spikes. That's 15.8V - four times in three days. If it were once, I'd write it off as a weird event, but it's quite frequent. It's apparently quite deliberate - it occurs at the end of the charge cycle, and is the final stage before the charger shuts down for a while. The charging amperage looks about like one would expect. It starts out around 6.5-7A (in the recommended range), and tapers off as the battery charges - this is normal. It looks like charging cuts off around 0.5A or a bit lower, then the battery voltage drops off as the charger disconnects and the battery runs the loads. 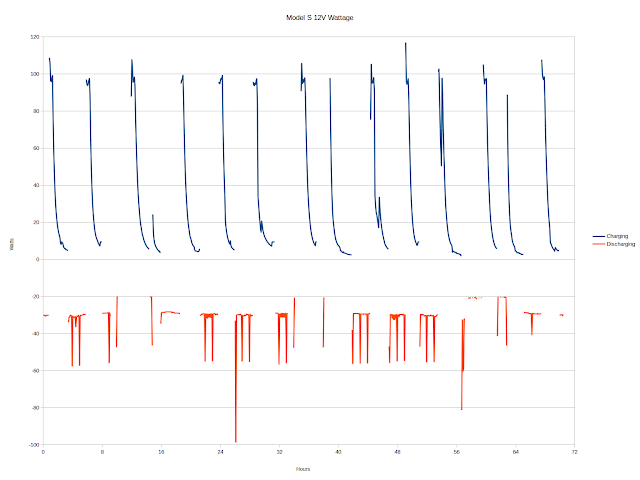 Finally, I've done Maths (TM) and come up with a wattage chart for charging and discharging. 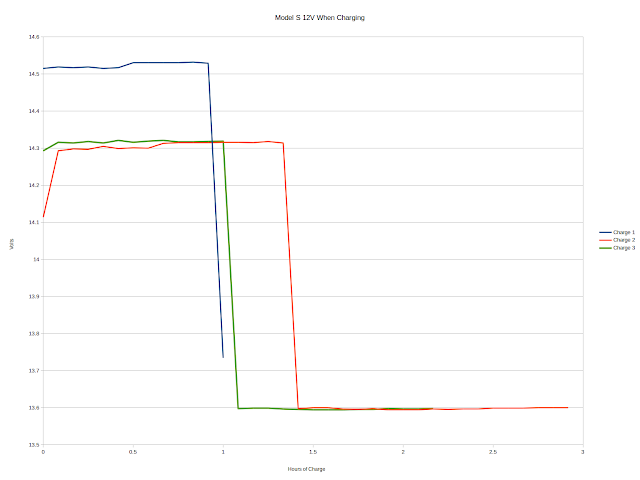 Charging is less interesting than discharge - but on the discharge side, you can see that the car almost always draws 30W, and occasionally pulls a good bit more out of the battery. 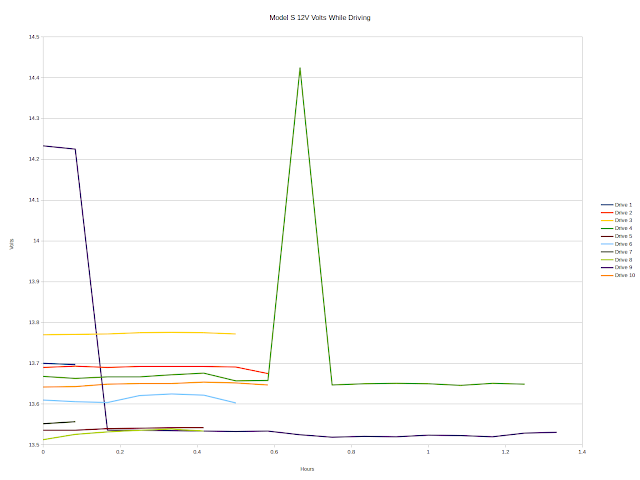 I don't have particularly fine grained data here, so those spikes are long enough to be significant. When driving, the car seems to run the 12V system at a moderate float charge voltage. 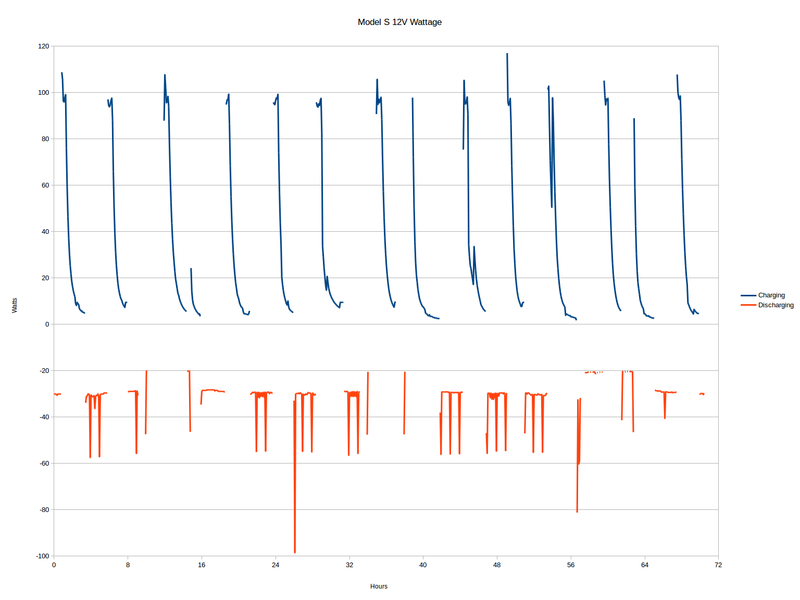 It holds the voltage between about 13.5V and 13.8V, and I suspect that the differences here are related to temperature of the battery (as the battery charging is temperature compensated - see below). This voltage means that the battery is neither charging or discharging (it might be charging, very slowly, but not enough to matter). Based on the stability of the voltages, the DC-DC converter is constantly on, and is targeting this voltage regardless of loads. I have no idea what that spike in the green chart is from, so it's probably safe to ignore. 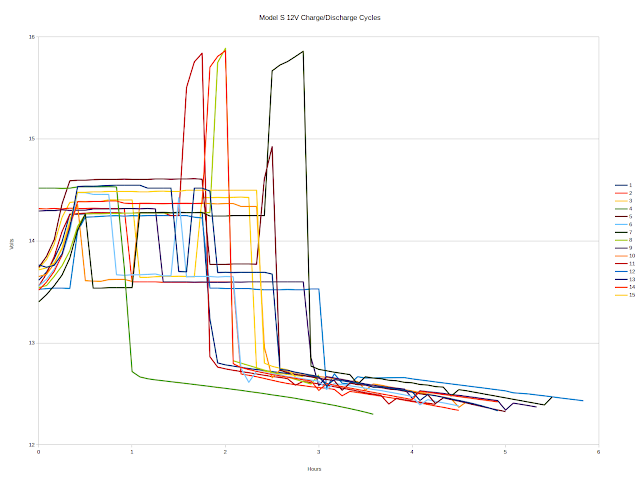 I did two charts related to charge/discharge behavior, comparing all the cycles together. This first one starts at the beginning of a charge cycle and goes to the end of the discharge cycle. 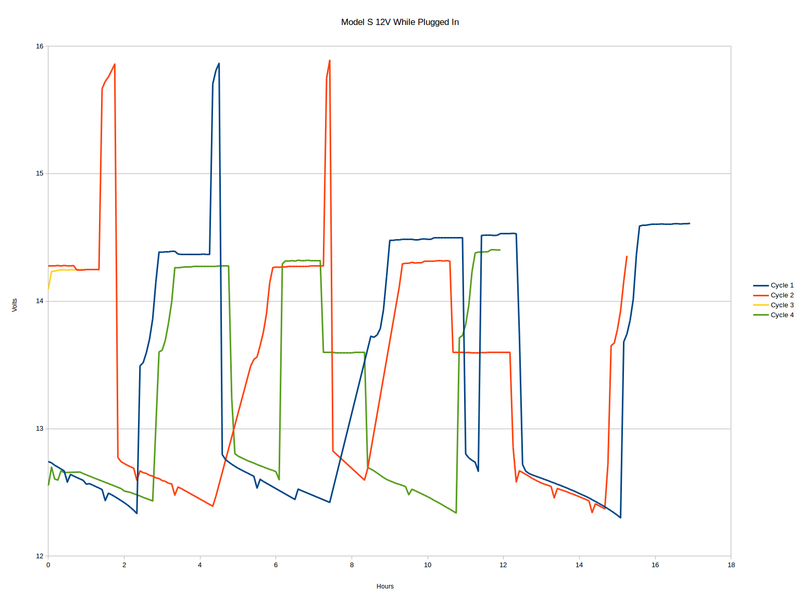 The second one is the same data, lined up at the start of the discharge part. And... I'm not entirely sure what to make of this, if I'm honest. It's a bit all over the place. There's significant time spent charging at 14.5V, significant time down at 13.5V, and those weird spikes to 15.8V, right at the end of the charge cycle. They look like equalization, but... it's an AGM battery. Those don't need to be blasted like that. The total charge/discharge cycle time ranges from 3.5-6h - so 4-8 cycles a day. Lining up from the start of discharge, the discharge interval is pretty constant. It's right in the 2-2.5h range, reliably. At 30W, that's around 60-80Wh, though there are those spikes to higher drains. If I ballpark 40W as an average, that's 80-100Wh per discharge cycle. That's only 25% of the battery capacity, so it should be good for 5000+ cycles per the spec sheet. Obviously, it's not lasting that long. It's really obvious here that the high voltage is always at the very end of the charge cycle. While the car is actually charging, the behavior is slightly different - it performs what looks like a standard three stage charge, dropping back to float after a little over an hour. What's float? A lower voltage, used after the battery is fully charged, that is a "safe" voltage for indefinite storage. Normally, you charge the battery to the higher absorb/service charge voltage (around 14.5V for these), then after doing that for a while, you drop back to the float voltage (13.5V) and stay there. The battery isn't really charging, isn't really discharging, isn't trying to recombine anything, and it's a mostly static place for the battery to hang out. This is good for longevity - it's not adding cycles, it's not creating gas, it's just sitting there. 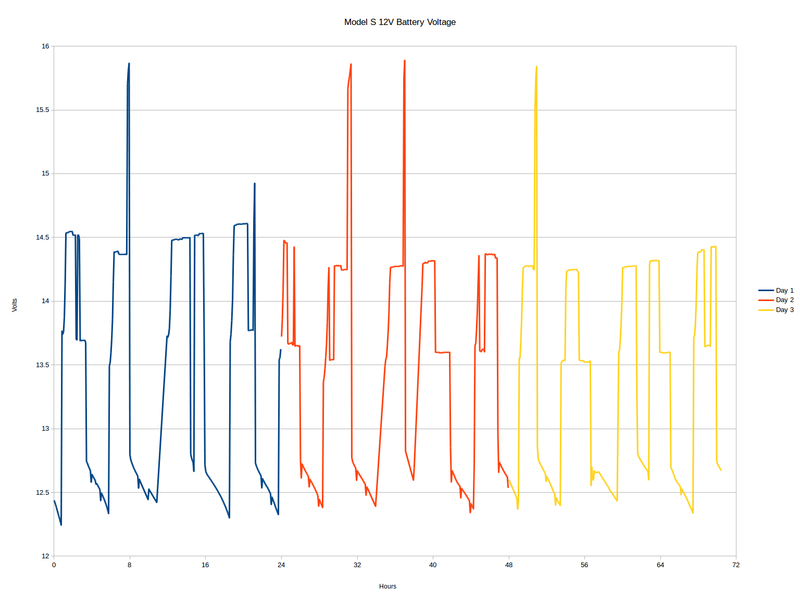 This is quite clear in the red and green lines - the battery is charged at 14.2V for an hour or so, then the car drops back to 13.6V and holds it there for the remainder of the charge. This is a great use of "shore power" - no cycles on the battery. I'm a bit surprised that the higher voltage charge interval is so short, though. Lead acid takes a while to charge. The data I got included some scheduled charging starts as well, and some time spent plugged in after the charge was finished. 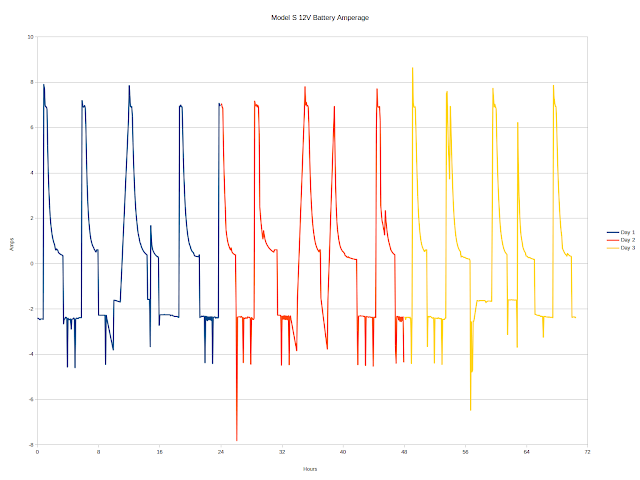 This is a plot of the 12V system voltage during the times when the car is plugged into the wall. 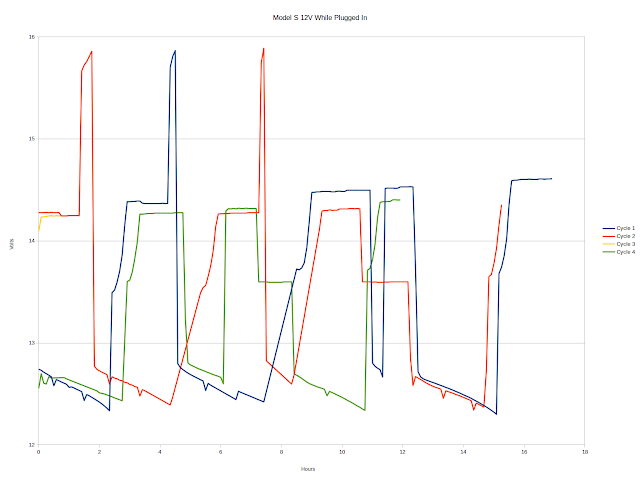 You can see the float periods on both the red and green lines (the flat parts at 13.5V), but it's very evident that, despite having power available from the wall, the car is still cycling the 12V battery. This seems a bit silly to me. I can faintly understand "You said don't start until 1AM, so I'm not going to draw anything from the wall" - but after the charge is finished? Why drop out of float at all? Just keep using shore power to keep the 12V battery happy. It could probably use a few hours at float (or higher) to charge it up fully. Finally, I looked into the temperature compensation behavior of the system. Lead acid requires different charging voltages at different temperatures (a common compensation is -0.005V per cell, per degree Celcius - so 0.03V per degree for a six cell car battery). And... yup. They're doing some sort of temperature compensation. 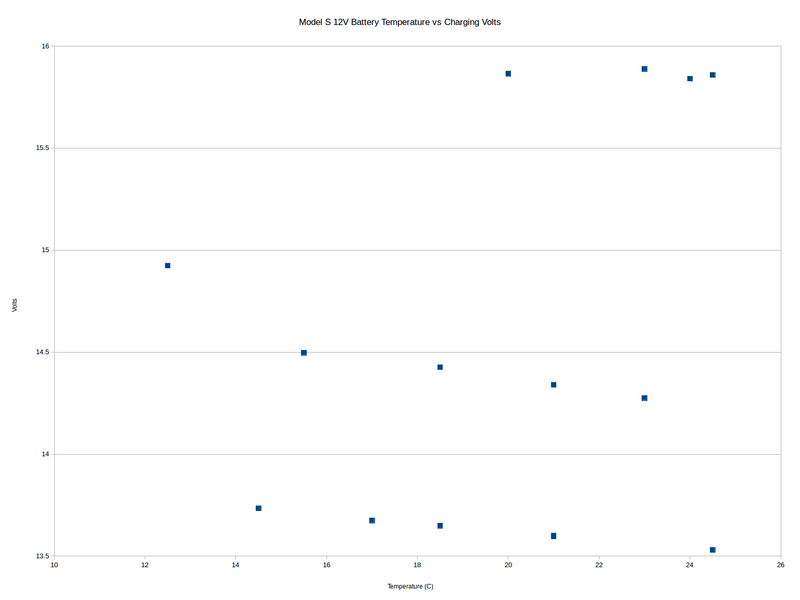 I graphed the "end of charge" voltages vs temperature here. You can see the weird high voltage stuff at the top, the normal charges at in the middle, and the float stages at the bottom. I haven't checked the actual slope, but it's quite clear that the car is doing some sort of temperature correction - which is a good thing. So... why does the Model S chew through 12V batteries? Here are my thoughts on the issue. First, the car is cycling the battery furiously - 5+ cycles per day. Lead acid is damaged by cycles, by chronic undercharging, and also by overcharging. It's a remarkably robust chemistry in that it shrugs off a lot of abuse and will keep functioning, but you pay in longevity. A well maintained lead acid battery can last 10 years or longer, while the same battery, abused, will die (be murdered, really) inside a year. Tesla is putting an insane number of cycles on this battery, so even in the best case, where everything else is right, it's going to die sooner than most people would expect. 5000 cycles at 5 cycles a day isn't even 3 years, and it's clear that the batteries are dying far sooner than that, around 1500-2500 cycles, in many cases. That's not an unreasonable lifespan for a lead acid battery, but a year is an unreasonably short time for a car battery. Third, those voltage spikes. Whiskey Tango Foxtrot. At no point in the data sheet do I find anything that says, "Hey, blast me with almost 16V on a daily basis." They look like an attempt to either equalize the battery or fully charge the battery, but what they're most likely doing is creating more gasses than the battery can recombine internally. When this happens, the valves ("valve regulated" - remember?) go into action and the battery vents some hydrogen and oxygen - but that's lost to the battery forever. Venting a sealed battery is a great way to permanently shorten its life. I've also seen reports that the failed batteries are bulging, which is consistent with high internal pressure from this. I don't think Tesla is deliberately trying to kill this battery quickly, but given this data series, I'm not one bit surprised that they die so rapidly. It kind of looks like they're trying to treat it like a lithium battery - "close enough to fully charged" and repeated cycling is more or less fine for lithium, but it's a great way to kill a lead acid battery in a hurry. They have sit at a higher voltage for a long period of time, somewhat regularly, if you want anything resembling rated life. Were one to tear down a dead 12V battery that the Model S killed, I expect you'd find badly sulfated plates from chronic undercharging, as well as dry glass mats and a very high specific gravity acid remaining (the water will separate and vent, but the acid does not). If someone were to tell me, "Fix the Model S 12V battery longevity issues," I'd take the following steps. Remember, I'm not a world class battery expert, but I do have an interest in lead acid longevity. Some tweaks are software, some are hardware. Put a bigger battery in. This battery is just too small for the car. Double or triple the size, pay the weight penalty (this is a 27lb battery, so 3x the size would only be an extra 50 lbs), and put something decently sized in - then adjust the software for it. You can reduce the cycle count significantly with a larger battery, and if you change nothing else, that should take the battery from a 1-1.5 year life to a 3-5 year life - much more reasonable. Find a way to perform longer absorb cycles, at least once a day. Lead can handle partial state of charge cycling decently, as long as it gets a good absorb cycle (so around 14.5V) regularly - you have to get it up there and let it sit to reabsorb the sulfate crystals into the acid and balance the plates. You can do this while plugged in at night, and I don't think it would hurt anything to run the higher voltage (14.5V or so) while driving. That's how a normal car charges the battery. Keep cycles off the battery whenever you can - whenever shore power (the charger) is connected. If the car is connected to a charger, you shouldn't be cycling the 12V battery up and down. Charge it, let it absorb for a while (a few hours is good), drop to float. Stay there until disconnected from the charger. I understand if they're reluctant to pull any current before the charge time, but I'd do that and add an advanced option to cancel it. Float time on an AGM battery is "free" - it doesn't do anything to degrade the battery. Eliminate those 15.8V spikes entirely. If you have longer absorb times (around 14.5V), the battery should be in good shape without any need to zap it like this. As a bonus, you won't have as much gassing and loss of water. Bulging batteries mean gassing, and high voltage causes gassing. AGM is much less forgiving of a high voltage than flooded lead acid. Sleep the computers when possible. The car is constantly drawing 30W and regularly pulls more - when turned off. I don't know what exactly goes on, but maybe some of it could happen when charging. In the realm of greater hardware redesign, a low power standby computer for handling stuff that always has to happen would help. Or maybe just leave the DC-DC converter on. I have no idea what the losses running that are, but lead acid charging is far from 100% efficient. It may be easier to just hold the battery at a float charge most of the time. I expect those changes would radically improve the 12V battery longevity. Even if you can't put a larger battery in, changing the behavior to reduce the cycles on the battery should help a lot, as should letting it charge for longer when possible. I'm pretty sure that can be done in software. Again, I'm not a professional battery engineer - just a guy who makes a living in an office with a big bank of lead acid batteries I'm not eager to replace. These are my suggestions, based on what I see in these few days of data and what I know about lead acid. I've spent an awful lot of time reading up on the chemistry, though. If anyone has data from early in the cars life, when they were just tearing through batteries, please get in touch with me. I'd love to compare with the current behavior. If you own a Tesla - what has your experience been with the 12V battery lifespan? Let me know in the comments! Another great article, thanks for sharing. I’m really glad I read this article. I was thinking about purchasing a Lithium Ion battery on Amazon. However, when I read about the cold temperature charging dangers I thought about my winter trips to Lake Tahoe and concluded I’m better off with the standard replacement from Tesla. Lead acid seems to be a dirty word among Tesla types, but they're really quite good batteries, for certain purposes, if you treat them properly - and they are amazingly tolerant of a massive range of environmental conditions. Not sure how the battery is doing, but what I can say is that my falcon wing door is broken. Aww... That's the one unique feature. I'm excited for the Model 3. It should drive used Leaf prices into the ground. I'll probably truck out your way and pick one up in a year or so. I monitor the 12 volt battery through the lighter plug. I don't know if I could detect degradation or not. What is the lowest voltage the system will boot from? I'm getting out there on the battery so my time is coming. Also, are the charge / discharge parameters you talk about controllable by software (FW) updates? 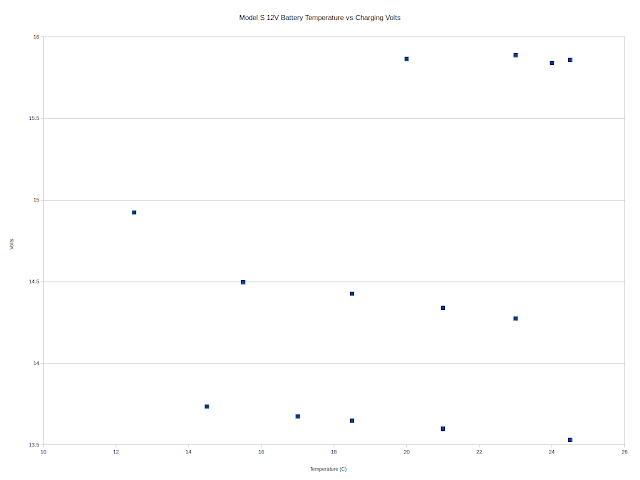 Dennis - you probably can't detect degradation solely from voltage. You could look at the time of cycling and see if the car is cycling the battery faster, but I don't really know what the car uses to determine there's a problem. As for lowest voltage? No clue. Go find someone with a bench Tesla and ask them to try. Presumably the charge/discharge parameters are controlled by an upgradeable firmware, but I have no idea where that would be or how to mess with it. I'm just a random guy, not a Tesla engineer. I mean, I don't even own one. Two years in, 28000km, and so far no battery issues. That means, having written this, I will go to my car and find a problem! September 2014 build. Still going strong at 2.75 years. "Or maybe just leave the DC-DC converter on." They should simply drop the 12v battery. The Dodge TEVan went this route, and it's obviously the superior option. Unfortunately, regulatory requirements for things like "keep the flashers working after a prime mover failure" mandate the 12V battery or a similar option. If the battery pack fails, the brake lights and such need to continue working as the car pulls off the road. I am manufacturing and selling Lithium batteries for the model S 12V/accessory system! Our batteries have been working very well, although we are young, and we have done extensive testing, including cold/freezing weather utilization. I have no idea who you are, or how anyone would get in touch with you, but if you're willing to share details of your pack, I'd be very interested. The contact form is over on the right column. I'd assume it's in the realm of a 4S LiFePO4 pack with some sort of internal heater? It's $400, but it's not clear how low the temp can fall before this battery is out of spec. It's not really well explained on that website. Excellent analysis and thank you very, very much for uncovering a lot of mysteries about the 12V-battery. As a comment, adding a 3x larger battery to get a 3x better longevity is a debatable. Also I would be cautious to draw rules from investigating the behavior of a single car, but you mentioned that, if I understood correctly. Is there a way how we could provide additional data/readouts from our cars to help you to improve the ecologic footprint of this very specific battery? I'm happy for whatever data you can provide. I'd be very interested in seeing voltage/current/temperature readings from a fresh 12V battery as well as from your replacement. If you'd like to get me more information, there's a contact form in the right column - let me know your email there and I'll respond to you and we can converse that way. Thanks for the detailed analysis. Have you send this info to Tesla? If so, have they responded? It was posted on Reddit, but I haven't specifically reached out to Tesla, nor would I know how to do so. I'm easy enough to contact if they want to get in touch with me, but I can't imagine they'd reach out to some random blogger about technical issues. Learning how to treat lead acid isn't hard. Could the voltage spikes be attempts to break up sulfation? I agree they seem odd for a sealed AGM. That was my guess, but that's the type of thing you can get away with, sort of, with a flooded battery. They tend to take overvoltage abuse by slowly corroding and gassing aggressively. AGMs will gas and vent, but at least with a flooded battery you can add more water. It's just a really weird behavior. Where did this data come from? 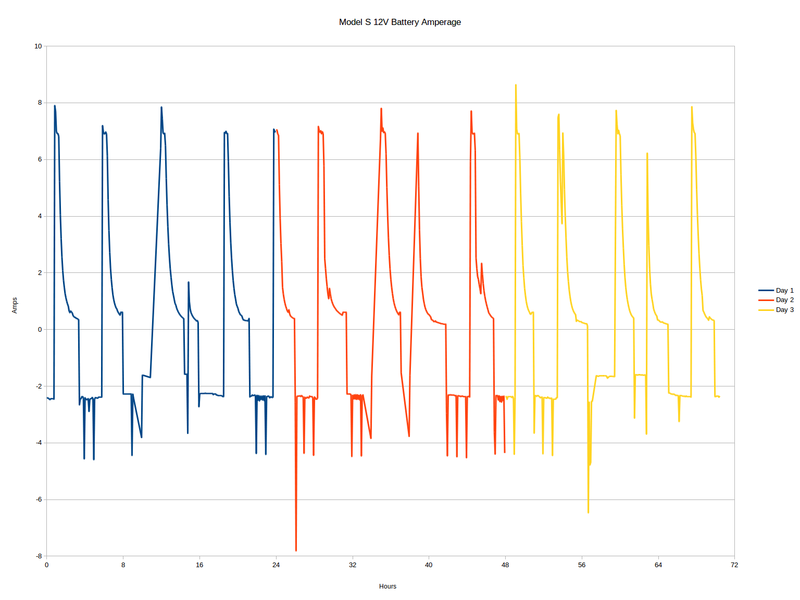 How can I pull similar data from my own car? From someone who has more access to their car's data streams than the average bear - it's not something everyone can gather this way. Please help me with finding a replacement for the tesla 12v battery, in my country we don't have tesla dealer and I have 6 cars not working. Normal 12v that fits other cars aren't working. I have no particular knowledge of what the computer looks for. You should be OK with any AGM battery of similar size and capacity. 12v battery warning came on my 2013 Model S just past it's 3 year anniversary. Fortunately, a Tesla technician did a house call to replace the battery, covered by warranty. Awesome article! Btw, any tips for users? I mean, for example i am using a dash cam which records 7/24. How much is bad for Tesla's 12v battery? Should i leave the car in "charging" state while over nights for sure? Or should i drive my car when i want to load on my cigarette charge port? Or should i charge the car maybe? The idle draw of the computers is so huge that it dwarfs anything else connected, and there's not a lot you can do short of hooking up a high power battery tender/charger when parked. I have no idea if that will upset the computer or not, and it probably needs to be able to source 4A to keep the battery charged with the draws on it (so your typical little battery tender won't do it). The dashcam uses 5W of power, tops. I think it is safe to leave on all the time if so desired. 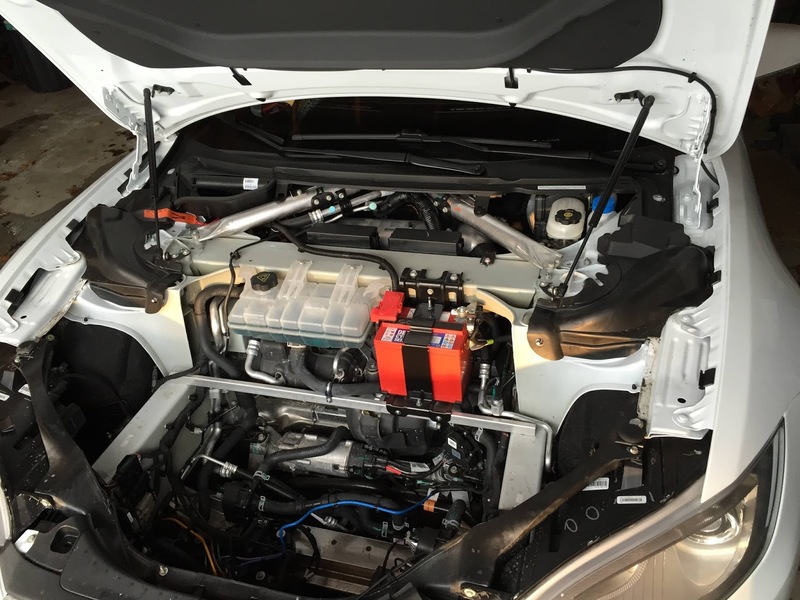 The main battery will still charge the 12V system when needed, correct? I don't think there is any chance of damaging the 12v system by drawing 5 more Watts. I wonder if it'd impact battery longevity in any significant way. I don't know the answer to that. They are using TIs active balancing system, and it dumps the charge to li-ion batteries onto 12v to balance itself, maybe that is why you see the spikes. Huh? That statement doesn't make particularly much sense without a lot more detail. The spikes are coming from the DC-DC converter, as I understand the system, and they always come right at the end of a 12V battery charge cycle (which has ~nothing to do with the main battery charging). I'm familiar with at least some of the TI BMS front end chips, and they normally dump into bleed resistors - the complexity required to dump charge into the 12V battery from main pack balancing is well beyond what would be reasonable. There are also some balancers that use small capacitors to shuffle charge from the high group to the low group, but I'm not sure that's used much anymore. Would hooking up a 12v trickle charger do any harm to the DC-DC converter while the car is parked for long periods of time? FWIW, I've put 200,000km on my 12v in four years with no failures. Russell. Do you know the maximum amperage of the DC-DC converter in a Tesla Model S 12v battery system? I see people have been using the cigarette lighter to run 150 watt DC-AC inverters. If the DC-DC converter is only 7 amps max, that will discharge the 12v battery. ~13v x 7A= 91 watts max. What about hard wiring a 30W 12V solar panel to charge the battery when parked? This way the vampire can be fed when parked outside. There are flexible solar panels that can do it for $50-100 and a 3A charge controller can run $10-20. At 21 x 13 in, they can act as a dashboard shade/cover. I’m still trying to understand if attaching a trickle charger to the 12v battery, as I have done with many other vehicles, isn’t a good solution pending the ultimate fix by Tesla. You need a reasonably high amp charger (4-5+ amp) for this but is there any issue with connecting a quick disconnect harness and plugging that in at night or for extended periods when the car will sit? Any issue float charging the 12x while the main charging is going on?
" I have no idea what that spike in the green chart is from, so it's probably safe to ignore." Enjoyed it, great article. I hope Tesla has been/is listening. Thanks. Great article, but I have a question concerning cold-weather charging: As the owner of a 2013 Model S that recently started warning me of the need to replace the 12V battery (and as it's out of warranty I'm considering a switch to lithium - a secondary issue), did I make a mistake by hooking up a 120V cord for 'trickle' charging the main HV pack on super-cold nights? January 2018 has seen 3 or 4 sub-zero F nights here in Ohio and I reasoned that letting it charge at a low current on those nights was better than going the 'cold soak' route. Do you think doing so was a mistake, did no harm, or given that the HV battery would have to heat itself to accept the 3 -4 mph charge, a good thing? Thanks in advance. I don't know enough about the charging behavior to know for sure, but I can't imagine you did any harm charging on cold nights. The pack won't charge above what it considers a safe rate for the temperature. I wouldn't switch your 12V battery to lithium if you're dealing with sub-zero-F nights. The charging system for the 12V battery isn't going to know about that, and hard charging on cold lithium causes lithium plating, which is irreversible capacity loss. Excellent article; very informative. In the past year I’ve built a few Li-Ion battery packs, one 18v, one 48v, what I’ve found is that they will charge above the designed 3.7v to as high of 5.2v. I suspect the voltage spikes you are measuring could be due to this tendency. While researching information on Li-Ion batteries I came across an article published by a University study describing the chemistry of Li-Ion batteries, which talked about runaway charging causing the batteries to overheat and catch fire. It talked about how the Li-ions acted inside the battery as opposed to conventional and lead acid batteries, which could also be a reason for the spikes. Li-Ion is a high energy battery, as you know lead acid is a low energy battery and are not compatible. For that reason, Lithium batteries should not be used to charge lead acid batteries. My suggestion would be to add a 12v regulator circuit between the lithium batteries and the lead acid battery; (old school tech). I have no idea what you're doing that leads to lithium cells charging to 5.2V/cell, but you might consider not doing that in the future. That's seriously damaging to the cell, and radically increasing the risk of thermal runaway, as well as destroying cycle life. Why on earth are you letting them up that high? Tesla isn't just bolting the lead acid battery to the pack voltage with a big relay - the main pack is a 400V pack fully charged. There's a DC-DC power regulator circuit in there, and you can see the behavior in the charts as it does temperature compensation, float voltages, and those spikes at the end. So, I'm sorry, I have no real idea what your point is. I use an IMAX charger to charge my bats in groups of four before I build my packs. I did see the DC TO DC reg in your post, what I am referring to is a means to isolate to see if that makes a difference with the circuit by means of a different regulator circuit. I am not an Engineer, just a tech, just one method I used to trouble shoot a problem. I wouldn't put a lithium battery as a replacement 12V in a car that will get that cold. It'll probably kill it in short order, because that's well below the charging temperature for most lithium cells, and the Tesla system beats the 12V battery pretty hard on charge. As far as "How hard can it be?" It's a Tesla. You probably need the specialized shop software to replace the battery. First off thank you for this very informative post. I am currently considering purchasing a used Model S which would be out of warranty. I know next to nothing about electrical wiring, but I understand that custom car audio folk use big capacitors to help prevent or mitigate damage to 12v batteries caused by high-wattage amplifiers and subwoofers. Such solutions are commercially available for ~$50. Is there any reason to believe that getting one of those installed could lengthen the life of Model S's 12v battery? It won't have any impact. The car audio guys are putting large capacitor banks not to help keep the batteries alive, but to service the very high current (and short duration) needs of some of the car amplifiers in competition use. I don't know particularly much about that world, but I do know they're pulling insane amps, and have massive spikes on top of that. The capacitors help keep the system from browning out and shutting down, and help provide cleaner pulses to the speakers (as the amplifiers can get the amps they need). It would have absolutely zero impact on the sort of chronic battery abuse Tesla subjects their lead acid batteries to. Great analysis, great article. I think that DC2DC converter should be always on, it will put a 12V battery at eazy. Modern DC2DC converters are very effective and have very small losses. Problem can be if cooling pump starts automatically if DC2DC is on, even with very small load. I do not think that car should cover losses from outlet when it is not charging HV battery though, in the end it will not make car take more energy effective anyway. Technically it would be convenient, but some of owners have OFF PEAK TIME energy plans where device connected to the vehicle reads the time when car takes energy from the outlet. I have a Model S registered 9th Jan 2016. The 12V battery was replaced under warranty in March 2018 at 38000. 1 Would maintenance charging when the car is parked in the garage (perhaps when not charging the main battery) be a benefit? The car is often only used every 2nd day so spends a fair time in the garage. 2 If the answer to 1 is 'yes', can i connect the charger via the cigarette lighter? If the cigarette lighter is "always live," it should work. I don't know if the Tesla one is or not. However, a typical battery maintainer won't keep up with the Tesla idle draw. 1.5A@12V is only 18W, and the car draws 30+W when "off" from the 12V system, so all you'll do is delay the discharge. WOW! That's a great post! I ran into some troubles with my 2013 Model S. The 12V I have now it's the second one on this car and this last one lasted for 2 years. The problem is that the car acts very strange in it looks like the battery can't hold the charge anymore. The computer, as a result, shuts down any system I try to use as a result so I get a full list of disabled things after a few minutes of driving ( Park Assists Unavailable, Traction Control Disabled, Stability Control Disabled, Regenerative Breaking Disabled, etc ). All of that because the 12V is acting very strange and the computer couldn't figure that out so instead of throwing me an error to replace the 12V, keeps going and disables any consumer that uses the 12V circuit. Thank you for this data! I now know not to buy a Li battery and I have a better understanding of why my battery failed after only 2 years.